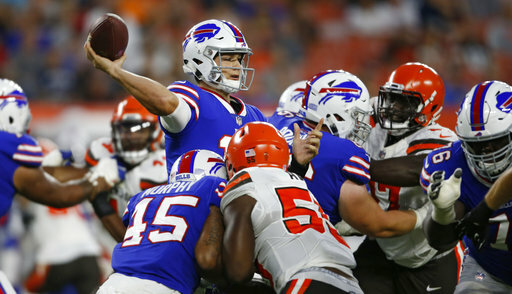 The Bills second preseason game vs the Browns gave me plenty to do on a Friday night (great scheduling!). Before you read any further, remember it’s the preseason, so there is no reason to panic or get overly excited. AJ McCarron got the start and the opening series was an underwhelming 3 and out. The first play was a nicely thrown ball into double coverage that was not completed to Kelvin Benjamin. The 2nd down play was a predictable screen play to LeSean McCoy that lost a yard. Third and long produced a QB scramble with nobody open and a punt. The second series started with a penalty,a completed pass, a McCoy run, and a sack on 3rd and long. Not great stuff, but things McCarron had to overcome to move forward in the QB competition. He didn’t do any of that. It was revealed later in the game that he suffered a shoulder injury, and some reports indicated it is a broken collarbone. That may have saved him from being cut (injury settlement possible) like TJ Yates was last year. Josh Allen was the second QB into the game and he flashed his rocket arm right away. It wasn’t a deep ball, but a laser that didn’t connect with Kelvin Benjamin. Allen was able to complete a third down pass with nice touch on a short sideline pass. Following that, he was sacked on a corner blitz, and scrambled on 3rd and long. A penalty kept the drive alive, and it resulted in a TD. In one series, Allen energized the team, the fan base, and in my opinion earned the start next week. Allen’s arm makes the Bills passing game a threat on every throw. He has a quick release, and the ball also arrives in a hurry. It wasn’t always on target, but more often than not, it was where it needed to be. I also think his abilities allowed Brian Daboll to vary the play calling too. Allen is more mobile, thus able to roll out, use more ball fakes in the running game, and create time to make other throws. I know the kid is raw, and will make mistakes, but why not start him next week? The practice week will determine that, and it does run the risk of getting overly excited, which I warned against at the start, but more reps are warranted for the first rounder. Making him wait seems pointless based upon the performances from this game. The starting offensive line performed as they look on paper, young and cheap. They were outclassed by the Browns front 7, and I fear that will be the case in many games this season. As the old adage goes, you get what you pay for. This unit will have to improve in order for LeSean McCoy to have his usual numbers, and to give Allen or Peterman a chance in the pocket. I focused on him during the first defensive series, which resulted in a Browns TD drive. On that drive he was slow to read and react to plays, easily blocked, and looked like a 20 year old playing against men. Frankly, he looked lost. But that ended. Edmunds quickly figured out he just needed to play football and not over think things. He started to rely on his instincts and ability to make plays sideline to sideline. He will have to start games well, but he is a rookie just like QB Josh Allen, so a learning curve is to be expected. I was eager to watch them play after seeing two episodes of Hard Knocks. Had I not watched that show on HBO it would have taken me a little bit to get used to seeing Tyrod Taylor in a Browns uniform. He looked like Tyrod, and I was glad to hear Andrew Catalon (Bills broadcast) stick with pronouncing his name the way we know it to be. Baker Mayfield saw plenty of time for the Browns, and he was exciting to watch. He is able to make plays with his feat, and it should be fun to see how long Taylor holds onto the starting spot in Cleveland. The stripe needs to return to the Browns helmet. The all orange helmet is not a good look. It made me recall when my high school team (Waterloo NY)wore all orange helmets just like that and opponents would call us pumpkin heads. We added a stripe and then went white with our mascot. The Browns logo is an orange helmet, which has tradition, but a bit week. Bring back the stripe. There was more to evaluate in this game, but it is the preseason and there is no need to over analyze the depth chart battles. 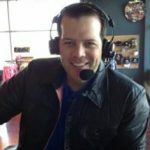 The conversation is and will be about Josh Allen, and deservedly so. Nathan Peterman played well during his time and may get the nod, but he’ll just be holding the place for Allen.